Mini celebrates 60 amazing years of this iconic car, from its revolutionary introduction to the popularity of its new-generation models. The first two-door Mini, introduced in 1959 and built until 2000, revolutionized automotive design with its innovative front-wheel-drive layout that made the car appear bigger on the inside than the outside. In 1999, the Mini was voted the second most influential car of the 20th century, behind the Ford Model T.
Designed for British Motor Corporation (BMC) by Sir Alec Issigonis and manufactured in England, Australia, Spain, Belgium, Chile, Italy, Portugal, South Africa, Uruguay, Venezuela, and Yugoslavia, the Mini was as successful in competition as it was on the street, winning the Monte Carlo Rally four times from 1964 through 1967. Originally built by BMC, the Mini's later parent company, Rover, was acquired by BMW in 1994. In 2000, BMW sold most of the Rover Group but retained the Mini brand. The last and 5,387,862nd original Mini rolled off the production line in October, 2000. In July 2001, BMW launched production of the new-generation of Mini which was sooned joined by Countryman, Clubman, convertible, Cooper Works, and numerous special editions. 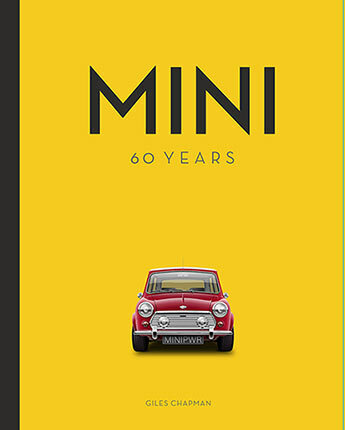 Nearly 20 years later, the new Minis remain as popular as the original from 1959. Giles Chapman is an award-winning writer and commentator on the industry, history, and culture of cars. He has worked across a vast array of media for 35 years, which includes writing 50 books on a diverse range of subjects. One of them, My Dad Had One of Those, is among the most popular car books of all time, with over 180,000 copies sold. Chapman's Car Compendium won the Montagu of Beaulieu Trophy in 2008. His interviews with people whose lives are in, around, and sometimes even opposed to cars appear regularly in newspapers and magazines, and he has written widely on car design and its impact on the wider world. Chapman's career began in automotive industry consultancy before moving into magazine publishing, where he was editor of Classic & Sports Car, the world's best-selling classic car magazine. He lives in Kent, UK.